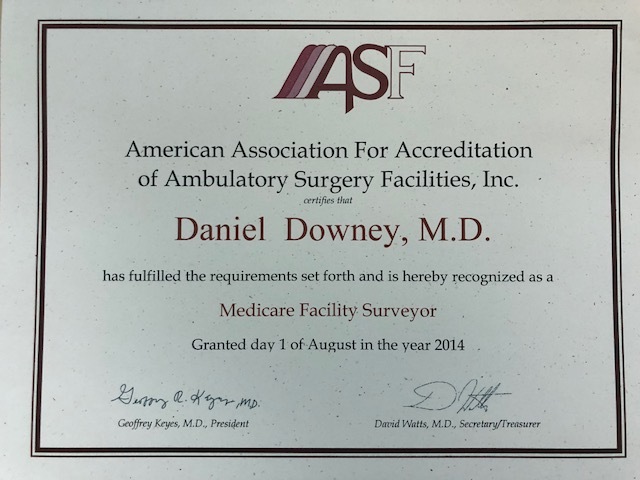 Dr Downey is also a surveyor for Medicare. 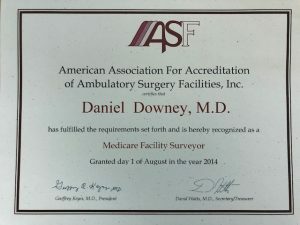 In addition to his own ASC (Ambulatory Surgery Center) being Medicare-certified by AAAASF (American Association for Accreditation of Ambulatory Surgery Facilities), he performs on-site inspections of other stand-alone ASCs on behalf of Medicare as a representative of AAAASF. This has taken him and a registered nurse co-surveyor to many fine facilities throughout the Western states. Fellow medical directors of their ASCs are encouraged to enter training to become surveyors also.